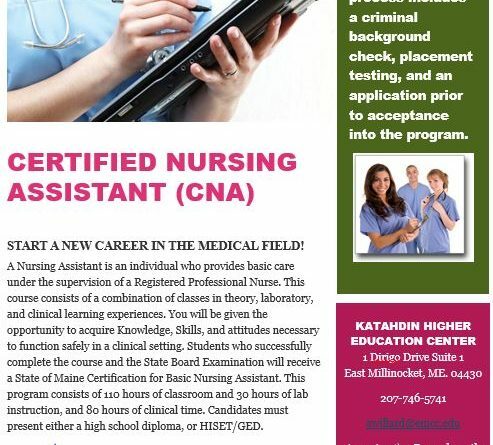 EAST MILLINOCKET — Eastern Maine Community College‘s Katahdin Higher Education Center in East Millinocket is pleased to announce the offering of a Certified Nursing Assistant Program in East Millinocket. Nursing assistants are nationally and locally one of the most in demand jobs in the allied healthcare field. A Nursing Assistant is an individual who provides basic care under the supervision of a Registered Nurse. This course consists of a combination of classes in theory, laboratory and clinical learning experiences. Learners will be given the opportunity to acquire the knowledge, skills and attitudes to function safely in a clinical setting. Those who successfully complete the course and the State of Mane Board examination, will receive a State of Maine Certification for the basic Nursing Assistant. Candidates must present either a high school diploma, or a GED/HiSet. The enrollment process includes a criminal background check, application and placement testing. This course is scheduled to begin with instructor Sharon Holway, RN from the end of August 20th – December 5th 2018, Mondays and Wednesdays from 1:30-5pm and Fridays 1-4pm at the Katahdin Higher Education Center in East Millinocket. You are a dislocated worker (legally entitled to work In the US and in compliance with Selective Service requirements) and have lost job due to no fault of your own. You are a displaced homemaker needing to seek full time employment because your spouse is unemployed, underemployed, or deceased. You are considered low-income, recipient of public assistance (SNAP, TANF or General Assistance), or basic skills deficient ((legally entitled to work In the US and in compliance with Selective Service requirements) Questions if you qualify for funding? Please call EMDC at 746-9608 x226. The Katahdin Region Higher Education Center of EMCC and the UMA is an off-campus center in the Katahdin Region where people can take courses, pursue degrees, and receive all the support they need to earn a degree close to home and on schedules that fit into their family and work lives. Courses are taught by faculty on-site, online, or two-way videoconferencing. Academic advising, tutoring, study skills workshops, computer access, library services and student activities are available to help support individual student success. The Katahdin Region Higher Education Center is located at 1 Dirigo Drive East Millinocket. More information is available by calling 746-5741.